In this latest episode of the Substandard (subscribe, tell your friends, leave a review! 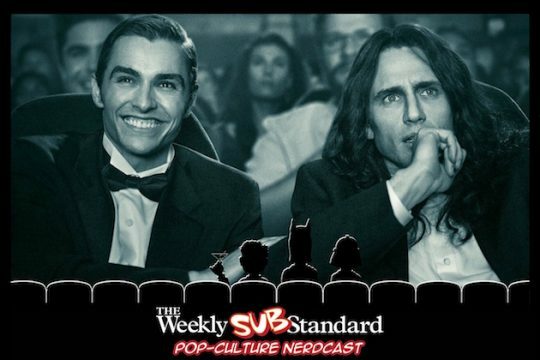 ), we discuss The Disaster Artist (Sonny rehashes his review of it), The Room, and what defines a cult classic: a small audience, small box office gross, niche humor, obscure movie lines? (When Sonny first suggested we do an episode on the James Franco movie based on The Room, I thought he was referring to that abduction nightmare starring Brie Larson.) In any event, The Princess Bride used to be thought of as a cult classic, but can it be still considered such? And what about The Shawshank Redemption, which had a dismal performance at the box office but has now been seen on cable by most everyone on Planet Earth? But honestly I am burying the lede here. Because the big story about this episode will be the studio rumble that breaks out among the cohosts. It's not pretty. It's the podcast equivalent of "We'll do it live!" And let me stress that it is not a staged incident. As JVL has recommended, do be careful listening to this episode while driving. We've already been involved in a car accident once (oh, hi Amanda! ), please don't let it happen again—and whatever you do, don't blame us! We also discuss the neighborhood equivalent of a chain letter known as Traveling Santa (akin, as Jonathan points out, to the tacky flamingo game). This segment also went a bit off the rails so it's been edited, shall we say, for clarity and content. In fact, this is one of our most heavily edited episodes. But when the Criterion Collection Substandard comes out, the unedited version of this episode will be available as a bonus track. After 55 main episodes, we're running on fumes. We're in need of a holiday. And mine just might be extended.